As a doctor or medical professional, you know how important it is to have an efficient working area, especially out in the field. La Boit Specialty Vehicles takes that into consideration when designing your medical vehicles. We realize you will be working out of our facilities for long periods of time and comfort is of the utmost importance. For you and for your patients! Units can be built for multi-purposes or for a specific need. 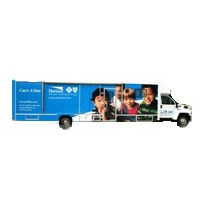 Learn more about Bloodmobiles, Mobile Medical Clinics and Mobile Dental Clinics now.